NHS Blood and Transplant reveals this World Sight Day (Thursday October 12) that its eye banks are 21% below the level needed supply hospitals. NHSBT is calling on more people to agree to donate their sight to meet the growing demand for corneas in the ageing population. As of September 29th, there were 278 corneas in NHSBT’s eye banks, which are in Manchester and Bristol. We aim to have 350 corneas in these banks at any one time to supply to hospitals for patients. NHS Blood and Transplant needs 70 donations a week to meet the demand for sight saving transplants but there is a regular shortfall in donations. The shortage of donors leads to patients waiting longer for transplants. Many people can donate their eyes for cornea transplants when they die, including people with most types of cancer. The cornea is the clear tissue on the front of the eye that help the eye to focus light. Although more than nine out of ten people on the NHS Organ Donor Register have consented to donate their eyes when they die, they are the part of the body that the most people say they do not want to donate, when recording their donation preferences on the NHS Organ Donor Register. Helen Gillan, General Manager for Tissue and Eye Services at NHSBT, said: “Donating sight means there can be light after darkness. “Our eye banks are currently well below the level we’d like to see. “You can help us by saying yes to cornea donation. “Almost anyone can donate their sight. People tell us the decision to donate brings a sense of pride and comfort. Martin Armstrong-Fox, a founding member of Fuchs Friends UK, a support group for those with the condition Fuchs Corneal Dystrophy, said: “The shortage of donors leads to delays and deterioration, seriously impacting our members’ ability to function day to day while waiting for treatment. Professor Stephen Kaye, of the St Paul's Eye Unit at The Royal Liverpool University Hospital, said: “While new surgical techniques are allowing us to treat multiple patients with each donated cornea, demand continues to exceed supply, and there is an urgent need for more people to register to donate. NHS Blood and Transplant has formed partnerships with several hospitals in the South East, Bristol, and Greater Manchester, to help address the long term ongoing shortage. These hospitals are all close to eye and tissue retrieval teams and are in areas with higher numbers of potential donors. The hospitals now have systems to routinely notify NHS Blood and Transplant of all potential donors, so that specialist nurses can phone the families and discuss cornea and tissue donation. Around 3000 families agree to donate their relative’s eyes each year. The whole eye is donated but only the cornea is transplanted into the recipient. Paralympic Swimmer, Stephanie Slater MBE, had a cornea transplant in her right eye in October 2016. Stephanie was diagnosed with the degenerative eye condition called keratoconus aged 11, which causes the corneas to thin. “By the time of the transplant I didn’t really have any vision in my right eye, it was cloudy and really blurry,” she said. Stephanie, who is from Preston but now lives in Manchester, found herself misjudging finishes and bumping into walls. She had to count her number of strokes to make sure she knew when to turn. The operation went smoothly and her eyesight is starting to gradually return now. Stephanie knows her donor was a woman in her 40s and she wrote a letter of thank you. 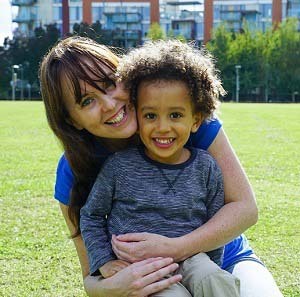 Laura Grady, 36, an underwriting specialist from Greenwich in London had two cornea transplants for an undiagnosed illness. She said: “I started getting ‘morning misting’. My vision was misty on waking, but cleared during the day. “By the time I had a transplant I couldn’t see out of my right eye. It was just grey. I could see light and dark but no definition at all. "After the transplants I can see my two year old son Noah’s lovely little face. Vivien Senior’s father Andrew, a tax director for Sumitomo Corporation, from Stoke Newington, died of pancreatic cancer aged 59 in 2016. Vivien, 27, a Software Sales Specialist for National Instruments from Faringdon in Oxfordshire, said: “Dad's cancer was one of the most aggressive tumours the specialists had ever seen, and it was two months from his diagnosis until he died. “The doctors told us it wouldn't be safe to donate his organs but that the one thing they could safely give to a patient was his corneas. “We had a letter to say dad's corneas had successfully been used for transplant. Lisa Ann Snaden, 28, from Wythenshawe in Manchester lost her left eye to complications from a rejected cornea transplant for kerataconus. The vision is currently stable in her right eye but if deteriorates she may need another transplant to be able to see at all. Lisa, a healthcare support worker at Wythenshawe Hospital, said: "People say things like 'I don't want to have no eyes when I go to heaven'. "I say 'what would you do if it was a member of your family that needed a transplant?'" If you aren’t already registered, sign up! Most people choose to donate all organs and tissues. However, should you wish to select your preference please say yes to cornea donation. Don’t forget to share your decision with those closest to you.